Talk about the year going past quickly, hasn't the decade overtaken it at lightning speed? I remember like it was yesterday when we bunkered down to watch the new millenium unfold and to wait for chaos to explode as Y2K appeared before us. More of a fizzle than a bang (the computer bugs, that is). 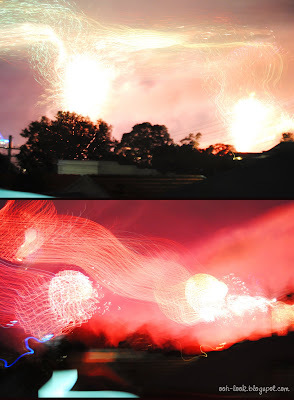 So here are some photos from this year's fireworks (the 9pm ones, it isn't midnight yet). They were suitably spectacular, with some new quad-colour ball fireworks drawing lots of applause. Happy New Year everyone, hoping that it's a wonderful year for us all. Update: The midnight fireworks! It's now officially 2010! 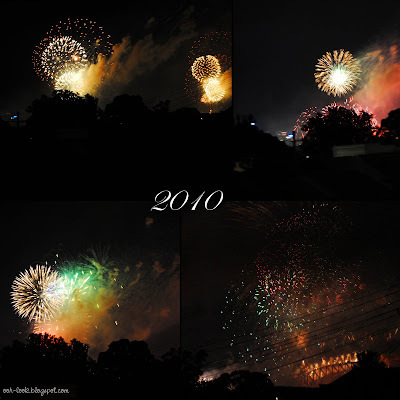 Don't know if it's a precursor of what's to come in 2010, but I was too lazy to walk the 10 minutes down to the end of the street to see the fireworks, so here are some photos taken from my upstairs window. Looks kind of apocalyptic, no? 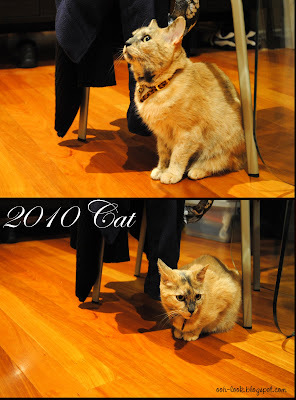 Afterwards, when I came downstairs, Tabitha cat was huddled under a chair, a little perturbed by all the booming... there, there, Tab, it's alright. Have loved getting to know your blog a bit better this year, and I look forward to reading more regular Adriano Zumbo updates in 2010 =) Happy new year, Belle! Happy New Year to you. Looks like I was a bit lazy as well and watched the fireworks from my attic window. Much less people that way! 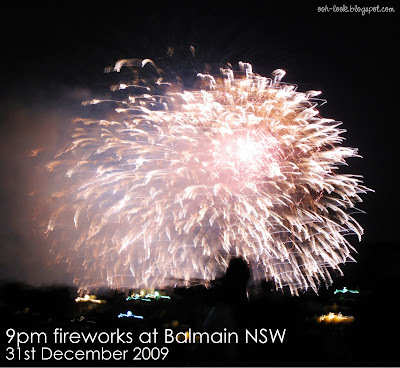 Wishing you a very happy new year, Belle :) Bring us more Zumbo in 2010!! Happy New Year. Hopefully we will meet this year sometime ehehe. BTW I tried your salted caramels. 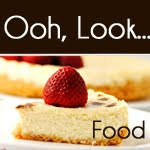 OMG Yummm thanks again for posting the recipe. The harbour bridge looked on fire with all the fireworks that were going off. Happy New Year Belle! Wow, what amazing photographs. Looking forward to 2010! You had TWO lots of fireworks? In Perth we had NONE! Wow what a view from your bedroom! Happy new year Belle and aww, poor Tabs! Aww, poor Tabitha! :) Nice fireworks pics and happy new year! 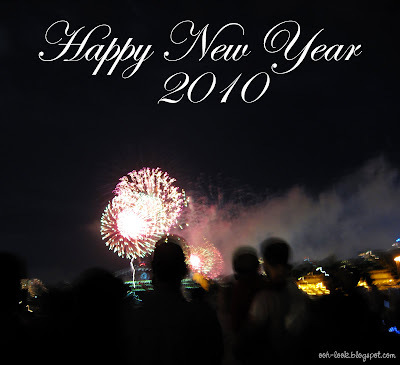 Happy new year 2010! Looks like u had the best view of the fireworks! Hey everybody - happy new year back at you! Thanks again for the hellos.